You are what you do. Those wise words apply equally well to mobile devices. Whereas Microsoft, Samsung HTC and others spend a lot of money marketing speeds and feeds (i.e. feature checklists, “fast” processors, etc. ), device performance invariably lags that hype. For example, though competitive on paper, Microsoft Surface benchmarks show the device’s web performance is really rather poor, as in bad. FutureMark has tested a wide range of popular mobile devices, both smartphones and tablets, for web performance. As one would expect the top of the chart is dominated — four of the top five — by Apple’s iPhone and iPad. Microsoft Surface benchmarks for web performance put it well down the list. 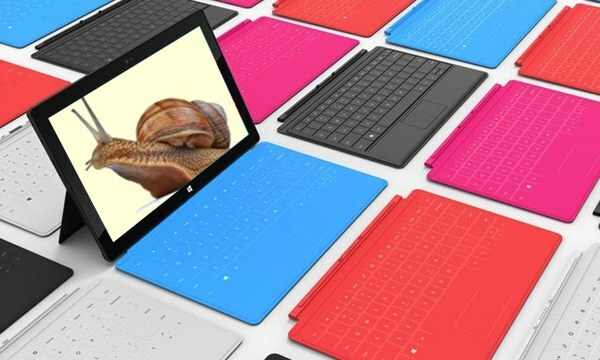 In fact, with a score 348, the Surface is slow, dead slow, versus the 515 points earned by the iPad mini — a device with the same internals as the nearly two-year-old iPad 2. The Samsung + Google Nexus 7 performs only marginally better than the Surface and well behind the iPad mini. And, as we all know, surfing the web is the number one thing tablet users do. No wonder then that 98 percent of tablet web usage is attributable to the iPad.